Flowers and herbs are more than just plants, they are a sustainable living organism providing all kinds of benefits to us from adding flavors in the kitchen to providing medical relief to ailments. Essential and infused oils have made a breakthrough in to the marketplace in recent years, and can sport impressive price tags. Did you know you can make your own finely crafted infused elixirs? The development of essential and infused oils is not a new practice, it has been used throughout history in ancient cultures for therapeutic, spiritual, cosmetic, and medicinal purposes. Want to channel your inner god(dess)? Good news is you make your own herbal infused oils with little effort with many items found in your home and garden! All you need is some of your favorite herbs and flowers and a little kitchen alchemy. Making your own infused herbal oils is an invigorating fun project an can lead to your own sensual beauty products an new flavorful marinades and dressings. Garden elixir party anyone?!? Here is our simple DIY cold infused herb oil recipe and some awesome links with helpful tips to making your own garden infused oils. Pick your concoction of 1 cup herbs or flowers or both. Fresh or dried can be used. For beginners dried is the best choice. A DRY bottle with an airtight lid. Richly colored ones or just plain-Jane mason jar. The dry part is extremely important. If your bottle is not thoroughly cleaned and dried it could potentially lead to mold development and spoiling your infused oil. Place your dried herbs/flowers in your DRY jar. Fill the jar half way with your herbs/flowers. Do not fill jar entirely, expansion will occur during the infusion process. Pour choice of oil over dried herbs/flowers to fill the jar. Slowly stir oil and herbs/flowers with wooden utensil to dislodge any air bubbles. DO NOT SHAKE! The oils need to have direct contact with the plant material to reduce the chance of mold development. Once herbs are completely submerged and air bubbles displaced, attached the lid and place your jar in a bright, sunny location for 2-6 weeks. 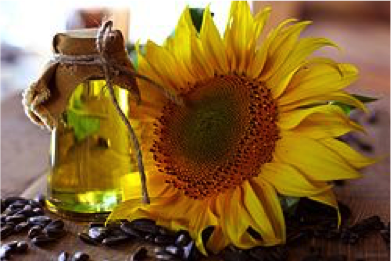 Sunlight encourages the plant material to release and infuse the oil with aromatic and savory characteristics. For the first week of infusion, make sure to remove the lid each day to check for mold and gently stir the elixir. After the first week, check once a week for mold development. Once the plant material begins to turn translucent or the 2-6 time frame has ended. Strain the plant material using a muslin cloth or some other form or strainer, then bottle, label and date your infused oil. You will tend to 6 months to year shelf life for your infused oils.